Accessory to War - Description | W. W. Norton & Company Ltd.
An exploration of the age-old complicity between sky watchers and war fighters, from the best-selling author of Astrophysics for People in a Hurry. 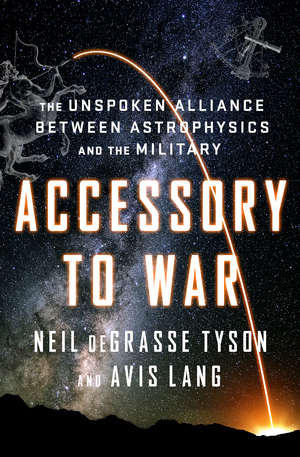 In this fascinating foray into the millennia-long relationship between science and military power, acclaimed astrophysicist and "the world's best science communicator" (Times Literary Supplement) Neil deGrasse Tyson and writer-researcher Avis Lang examine how the methods and tools of astrophysics have been enlisted in the service of war. "The overlap is strong, and the knowledge flows in both directions", say the authors, because astrophysicists and military planners care about many of the same things: multi-spectral detection, ranging, tracking, imaging, high ground, nuclear fusion and access to space. Tyson and Lang call it a "curiously complicit" alliance. "The universe is both the ultimate frontier and the highest of high grounds", they write. "Shared by both space scientists and space warriors, it’s a laboratory for one and a battlefield for the other. The explorer wants to understand it; the soldier wants to dominate it. But without the right technology—which is more or less the same technology for both parties—nobody can get to it, operate in it, scrutinise it, dominate it or use it to their advantage and someone else’s disadvantage." 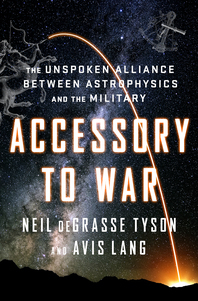 Spanning early celestial navigation to satellite-enabled warfare, Accessory to War is a richly researched and provocative examination of the intersection of science, technology, industry and power that will introduce Tyson’s millions of fans to yet another dimension of how the universe has shaped our lives and our world. America’s most celebrated astrophysicist invites young readers toexplore the mysteries of the universe. The #1 New York Times Bestseller: The essential universe, from a celebrated and beloved astrophysicist. With ease and originality, Tyson illuminates topics ranging from the linguistic merits of astrophysics to the limits of our five senses to the search for life in the universe. A thought-provoking and humorous collection on NASA and the future of space travel.